First contact has to leave a lasting impression about your capabilities on a potential client especially for a service provider. 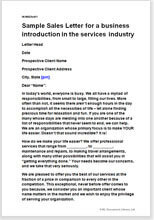 This document has been designed for use by a service concern sending off an introduction letter to a potential client and is meant to leave that impact that impresses the potential client and prompts the client to start a dialogue with you. A short list of the service providing businesses who can use this document to enhance their sales figures can be summed up as: Computer Software development; Data Processing; Data Entry; Maintenance services such as electrical, air conditioning, plumbing, house keeping, Computer Hardware maintenance, etc., investment and financial consultants, and many other similar businesses in the service providing segment. Any firm, Company or individual offering services of the types of Air conditioning – annual maintenance and repairs, house keeping, concierge, electrical repairs, computer repairs and maintenance, furniture, interior decoration, books sales, journal services, cab services, stationary supplies, transport services, courier services, etc. Explanatory notes to help with finer drafting points. An impressive presentation to improve chances of winning the deal.